Laura Mercier is introducing two new products this September, and she will be donating an impressive 100% of the profits to The Laura Mercier Ovarian Cancer Fund. The Fund's mission is to raise awareness and fund research and educational efforts that will help diagnose, treat and support women with ovarian cancer. I love the photo I've been seeing in print ads for this initiative, which is also the pictorial on the web site's home page. 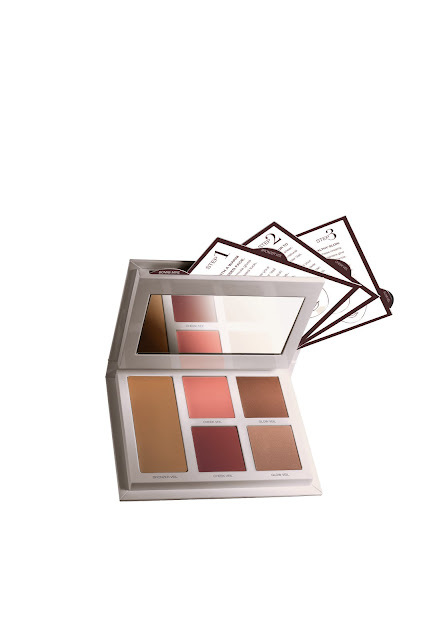 Beginning in September 2012, in recognition of Ovarian Cancer Awareness Month, Laura Mercier will donate 100 percent of the profits from the sale of two products – Bonne Mine Healthy Glow for Face & Cheeks Crème Colour Palette and Rose Hope Lip Glacé – to the Fund. This cause is very near and dear to the hearts of Laura Mercier, and the company’s President and CEO, Claudia Poccia. Both women have been personally touched by the disease – Laura through a dear friend, and Claudia through her sister. Laura Mercier gives back with the launch of the Laura Mercier Ovarian Cancer Fund. The mission is to raise awareness and fund research and educational efforts that will help diagnose, treat and support women with ovarian cancer. Beginning in September 2012, in recognition of Ovarian Cancer Awareness Month, 100% of the profits from the sale of two products will be donated to the Laura Mercier Ovarian Cancer Fund. Great cause, but I really wish she'd had an unusual (for her) product: a Teal Velvet shadow compact, a unique teal nail lacquer, even mascara. Anonymous~I agree, I think it's a fantastic cause and that the 100% is so generous. I'm a big fan of LM and her normally subdued colors, so I was hopeful when I saw the ad that there would be something a little as you say, "unusual for her". I do love the gloss shade, so maybe next year we'll see some teal in the mix for the Fund products. You rock Laura Mercier! 100% of profits to ovarian cancer is awesome! Next, maybe teal nail polish or teal mascara!